Blog about most general theory of Universe. Why Scientific 'Truth' So Often Turns Out Wrong. This post is motivated with John Allen Paulos's article The Decline Effect and Why Scientific 'Truth' So Often Turns Out Wrong. In AWT this phenomena can be of real emergent nature and it manifests itself with switching of intersubjectively accepted opinion into dual perspective, whenever the density of facts increases up to certain level. It's analogous to dispersive spreading of waves at the water surface, which is switching its character with distance from longitudinal into transverse waves and back into longitudinal waves again. It corresponds the layered fractally nested character of Universe and observable reality. For example, from terrestrial perspective the epicycle model of solar system appears relevant. With increasing scope this model has been replaced with heliocentric model but now the evolution of galactic arms can be described with epicycle model again. It's just the number of observable objects, which makes epicycle or heliocentric model more relevant. After all, the acceptation/refusal of aether model is of the same emergent evolution. Before some time old Greeks believed in Aether, later (Newton) this concept has been replaced with concept of absolute space. In 19th century the aether based models were quite popular again, but they're were replaced later with relativity model of space-time. Now the aether model is returning into physics again with model of Higgs field, which is responsible for particle mass. The emergent character of observable reality can be understood by example of compression of gas, which is changing into fluid or even solid during this. The density fluctuations of newly formed phase are behaving like another generation of gas particles and when the compression continues, they're condensing and changing into nested fluid phase and solid again. The newly formed phase is embedded into previous generation of matter and this process can be repeated many times. I presume, the same evolution occurs during pilling and condensation of facts into theories in hyperdimensional causal space. I Czech we have a proverb: "Stokrát nic umořilo osla" which roughly means "A hundred times nothing killed the donkey". The meaning of this proverb is, even the smallest chores are tiresome (if there is too many). 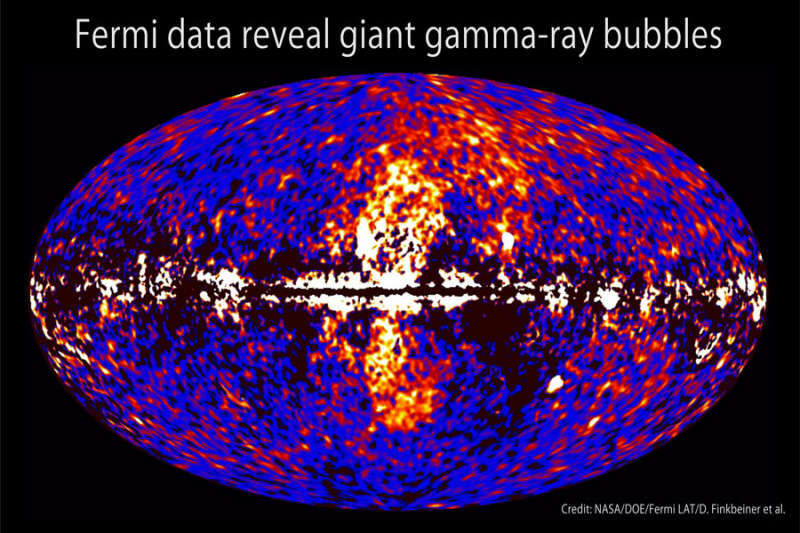 CfA astronomer Doug Finkbeiner, together with two of his students, Meng Su and Tracy Slatyer, used NASA's Fermi Gamma Ray Telescope to study the diffuse gamma ray emission. They revealed humongous bubbles of high energy emission protruding about 50,000 light-years above and below the galaxy, and centered on its nucleus. Recently, it was confirmed independently from IBEX observations, the Sun going to enter soon a million-degree galactic cloud of interstellar gas. At the time of this prediction, astronomers believed that the cores of galaxies, including our own, become active ("explode") about every 10 to 100 million years and stay active for about a million years. Since our own Galactic core presently appears quiescent, they believed it would likely remain inactive for many tens of millions of years. Although in 1977, astronomer Jan Oort cited evidence that our Galactic core has been active within the past 10,000 years. In Ph.D. dissertation, Paul LaViolette hypothesized that galactic core explosions recur about every 10,000 years and last for several hundred to a few thousand years. He was the first to suggest such a short recurrence time for galactic core explosions and that our own Galactic core undergoes Seyfert-like explosions with similar frequency. In 1983 Paul LaViolette presented evidence to the scientific community indicating that galactic core explosions actually occur about every 13,000 - 26,000 years for major outbursts and more frequently for lesser events. The emitted cosmic rays escape from the core virtually unimpeded. As they travel radially outward through the Galaxy, they form a spherical shell that advances at a velocity approaching the speed of light. LaViolette's research suggests that the Sun also became highly active as dust and gas falling onto its surface induced extreme flaring activity. Together with the radiation influx from the Sun's dust cocoon, this caused the Sun's corona and photosphere to inflate, much as is observed today in dust-choked stars called "T Tauri stars." These various solar effects caused atmospheric warming and inversion conditions that facilitated glacial growth which brought on ice age conditions. On occasions when the solar radiation influx to the Earth became particularly high, the ice age climate warmed, initiating episodes of rapid glacial melting and continental flooding. There is evidence that one particularly tragic solar flare event occurred around 12,900 years ago during a period when the Sun was particularly active. This involved the release of an immense coronal mass ejection which engulfed the Earth and induced a mass animal extinction. Details of this scenario are described in Paul LaViolette's book Earth Under Fire as well as in a series of journal articles he has published. Astronomical observations show the last major Galactic core explosion occurred as recently as 10,000 to 15,000 years ago. LaViolette has an analysis of this evidence of a superwave event on his blog (YT video). The geometry of the bubbles coincide with a superwave event occuring approximately 26000 years ago, which is supported by evidence in the ice core record. Data obtained from polar ice core samples show evidence of this cosmic ray event as well as other cosmic ray intensity peaks from earlier times. Do galaxies shrink with time? Albeit Universe is expanding seemingly (Hubble 1929), the astronomers have found recently, the galaxies are actually shrinking with time. Because a true galaxy-size increase would be incompatible with standard cosmology, if not with the laws of gravity, authors indicate the presence of systematical errors in Sloan Digital Sky Survey. Albeit I do believe, this finding is actually consistent with particle dispersion model of Universe expansion, in which objects smaller then the wavelength of CMBR are expanding with time, but the objects larger then the CMBR wavelength are collapsing instead in analogy with capillary wave dispersion at the water surface. In accordance with this model many phenomena related to red shift actually disappaer for CMBR wavelengths (CMBR photons cannot disperse with itself). Shrinking of galaxies is therefore consistent with AWT model of surface ripples dispersion at the water surface and with time symmetry of omnidirectional Universe expansion, predicted with AWT. The Universe should expand seemingly in light shorter then the wavelength of CMBR, which is known as a red shift (Hubble 1929). In light of wavelengths larger then CMB wavelength a blue shift and attenuation of light with distance should be actually observed. The attenuation of distant radio source with distance has been already observed, too. Last July, US astronomers announced surprising results from a high-altitude balloon experiment called ARCADE-2, which had made careful measurements of the sky at radio wavelengths. The background radio emission, which is the component smoothly distributed across the whole sky, was several times brighter than anyone was expecting. Aether Wave Theory cannot predict the absolute value of the gain observed in this moment - but it predicts, at the wavelength of CMBR this gain should be zero, which is what has been actually observed. Actually it's just a consequence of fact, for structures larger then the wavelenght of CMBR the gravity dominates over quantum effects (pressure of CMBR), so that such objects are collapsing. Because these objects are observable only with light of comparable wavelength, the Universe should appear collapsing, when being observed in radiowaves. Regarding blue shift of radiowave source, it has been observed possibly, too as a Pioneer maser anomaly (compare the LaViolette's blueshifting prediction). Blue shift is notoriously difficult to observe, because of lack or reliable reference sources of known frequency (hydrogen vibration spectra of remote sources are absorbed heavily with interstellar gas). But some man-made objects are already remote enough to observe blueshift with artificial sources of radiowaves. It means, the time arrow is actually violated, our Universe doesn't travel through time in one direction. One half of Universe expands due the pressure of radiation and its entropy increases. The second part (this one larger then ~2 mm) collapses with its gravity instead and its entropy goes down. This post is a reaction to the recent article (more details) in which individual brainpower contributes little to collective smarts. Instead, it’s social awareness -- the ability to pick up on emotional cues in others -- that seems to determine how smart a group can be. When we write something new in internet discussion, we just get negative voting usually, because people aren't prepared to get new generally valid information from individuals at all. Instead of this, the more irrelevant and widespread is the internet meme in your answers, the higher score you get - because it's considered "witty". Actually you're just repeating things, which most of people are already expecting to listen unconsciously. Most of people don't expect to hear some revolutionary ideas at all - instead of this, they're feeling confounded, if not confused when being confronted with them. It should be pointed out, the poor language skills are making the sharing of emotions much more difficult, then the sharing of logical information. In addition, socially successful people tend to ignore logical arguments. Unfortunately it works in both directions, as Joseph Goebels knew already. Actually, in dense aether theory a rather simple wave spreading model can be applied to this situation. This model renders human society like particle system, where every particle exhibits it's own surface gradient of information density, i.e. the intelligence. Theories, i.e. well accepted paradigms of human thinking correspond the density gradients at the water surface and the intelligent ideas are corresponding causual, i.e. tranverse waves in causual space, similar to ripples at the water surface. The emotional feelings correspond the longitudinal waves instead, similar to underwater sound waves. The underwater waves are weaker but they're spreading in much faster way - whereas surface waves tend to bounce from every gradient of information density (i.e. intelligence). Very bright people are behaving like black holes in this model - they're collecting all informations freely, but their experience cannot be shared easily, because of total reflection mechanism at their surface gradient of intelligence density. With compare to it, very dumb people are behaving like mirror-like bubbles with respect to transverse waves instead: they're empty and they're even reflecting all causal information coming from outside. A well known kind of symmetry between formal (IQ) and nonformal intelligence (EQ) exists here, though: dumb people are often quite sensitive emotionally and they can be manipulated easily in this way, whereas logical argument doesn't count very much for them. Instead of it, formally bright people are rather emotional nuts and they lack EQ and social skills often - compare the Sheldon Cooper character from The Big Bang Theory sitcom. The only way, in which black hole can radiate it's information to outside is the gravitational waves, which appear like Howking radiation. This mechanism is relatively subtle though, which explains, why really intelligent ideas are propagating slowly to the rest of society. Nevertheless, they can be supported with sufficiently emotional propaganda. For example, string theory (which is actually quite incomprehensible for laymans) is promoted with shots of beauty violinists in play at Nova TV show. Should journalists second guess the scientific truth? This post is a reaction to recent article of Lubos Motl of the same name. It's not surprising, Motl supports his restrictive stance, regarding the rights to expression of private opinion from the side of journalists. But we shouldn't neglect the fact, with respect to climatic science Lubos is just an educated journalist like everyone else and he violates his own rules flagrantly, because he is trying to influent public meaning massively all the time. He is just trying to dispute rights of journalists to the same activity, which he dedicated most of his time - and because he uses Google Adsense on his blog, he's even earning some money for it like professional journalists. In general, opinion of experts matters from intrinsic perspective only. But just because experts are specialized to narrow area of their private interest, they're not overmuch qualified in judging of their opinions in wider context - on the contrary, they tend to occupy their stances rather blindly - the more, the more they feel being an experts in given area. In this context the reading of articles The era of expert failure by Arnold Kling, Why experts are usually wrong by David H. Freeman and Why the experts missed the crash by Phill Tetlock (in Czech) may be useful not only for Lubos Motl. Niels Bohr: "An expert is a man who has made all the mistakes which can be made in a very narrow field". What do you think about AWT?